Angels are one of the most recurrent and disturbing themes of universal art. Messengers from heaven, are purely spiritual entities. According to religious tradition God uses them to take His orders and carry out His special missions : the guardian angel, the herald angel, angel of death, the Messenger Angel, the Angel of Love, among others. Maria Elena Rodriguez La Rosa has taken the theme of «Angels» to answer her formal and conceptual needs,implicit in her preceding work. In the constant purification of her work, she has created the angels tenderly, utilizing the plastic media of painting and sculpture. Malena’s work process involves constant synthesis and reflection in order to best express her feelings and concerns. 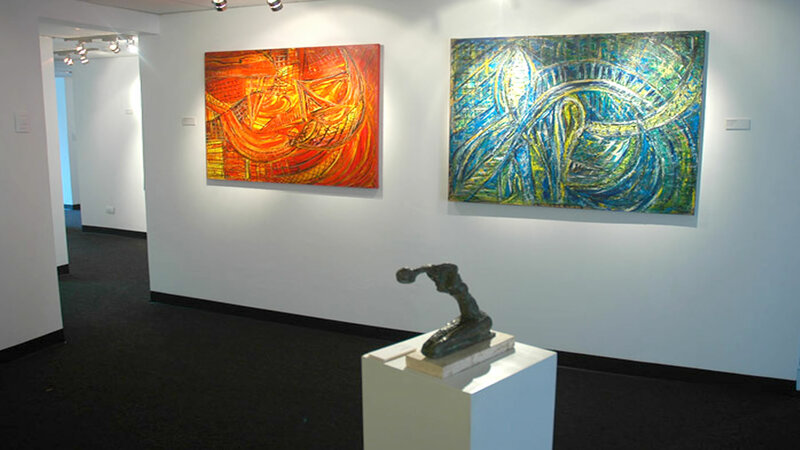 Each sculpture develops a space of its own through the use of specific color and material. The artist infuses the work with a spiritual quality uniquely her own. The sculptural elements are all essential; not excessive. This artistic intelligence is evident in all of her creations. She makes us forget the effects of detail in her beautiful handmade bronze or acrylic sculptures ,and bring us the essential of art. Her dialogue with materials is never fortuitous, and a series of thoughtful drawings always precedes the sculpture process. Her constant production assures the evolution of ideas and possibilities in a sensitive, sincere manner. Malena’s work tunes in to the particular world of the masses and recesses of each sculpture. Pure colours are laid down in firm, generous, brush strokes in her paintings, and the simplicity of the forms creates power and elegance. Harmony of design in all of her work transforms the raw materials into pieces of art. The strength of a woman who lives for her art is evident in all of her creations. It’s another case of that binomial «Life = Art» that encourages the way an artist creates their work. Her sculpture is amazing, and succeeds beautifully due to her game of «masses vs emptiness». Well designed rhythms exist within her solid, three dimensional works. The dynamic forms and carefully crafted «unfinished» surfaces are a counter balance to the static qualities exerted by the figures. This work has been created with great care, tenderness, and a vital life force. Her paintings are expressionistic in every way…her drawings are resolved, incisive, and visceral. The full, saturated colors tie each pictorial composition together in a passionate way, achieving a strong, artistic statement. Her personal visual language gives artistic expression and power to each painting. María Elena´s work suggests a dichotomy fusion : woman of great force possessed by tenacious discipline and work. I recently had the opportunity to appreciate the attractive «Ink Drawings and Paintings» of Maria Elena Rodriguez La Rosa. Cristina Gálvez influence is notorious,but Malena clearly illustrates her free and personal style with great elegance and intelligence. Her work stems from ancestral roots,incisive symbols and the modern world as well. Her silhouettes are varied and not easy to assess at first glance. They require thought and openness from the viewer. She creates the work from an alert and generous spirit. Bronze is the most enduring of metals for casting statues because of its beautiful colour that matures with time. Bronze allows the statue to be touched so the form of the work can felt just as the artist felt it during its creation. María Elena uses bronze in her most effective series of cast statues – The Angels. Each angel has a slender and graceful human form but is balanced by the strong presence from their expressive and perhaps symbolic poses. The anatomical form of the angels stems from the María Elena´s extensive knowledge of human anatomy, which is fundamental to creating such imposing statuary. The skill is reflected in the variety of expressive and naturalistic poses-from the authoritative pointing angel to the weary, resting angel. Each has grace and movement where you can believe that the angels have souls, which is a reflection of the artist´s skill. María Elena has achieves in bronze a beautiful balance of form, movement and expression creating bronze that speak-the angels live up to their name.